Park Primary is a historic stone school building situated on the side of a hill. This is enough to give anyone a challenge! With some juggling and remeasuring we managed to propose a solution to introduce some inspiration into the play area for the children. Firstly the removal of a huge stone wall that had divided the play areas between junior and infants. This would provide an opportunity to squeeze in a clamber stack climbing frame and a low timber sleeper wall to make up the cut and fill, flat area. 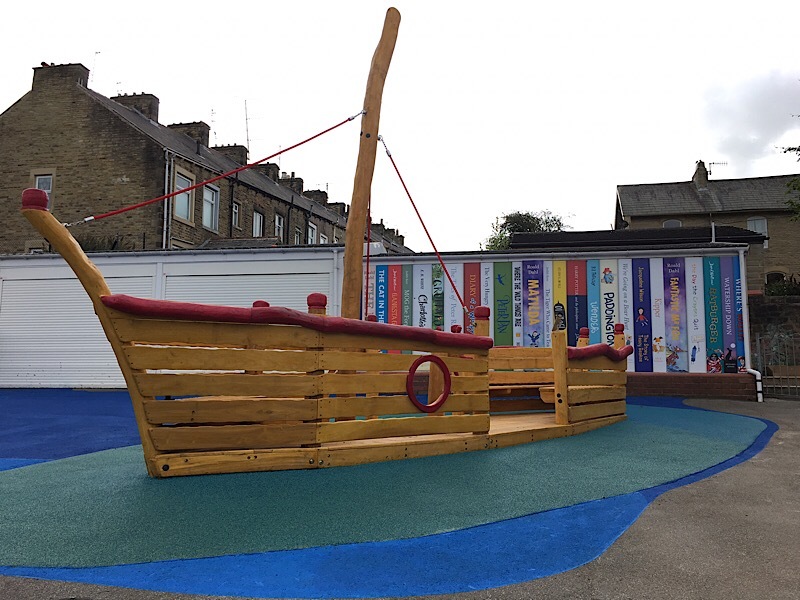 The top of the ‘hill’ in the school playground provides space for the Viking Ship and fantastic back drop, a huge wall of books! Sometimes even wikipedia helps us out with ideas ‘From the early 6th century to the late 10th century, Colne came under Northumbrian and then Viking rule, finally coming firmly under Norman control in the 11th century’ – that was enough for our ‘Viking Ship’ ! We also removed some historical murals from the walls to expose the stonework and have installed a green wall of plants. Stone carving with the children produced their own legacy pieces of artwork for an external wall display.